Officials are investigating an explosion on Cypress Black Bayou over the weekend that injured nine people. On Saturday evening, just after 5 p.m., a boat carrying nine passengers blew up in the water. The charred remains of the boat were fished out of the lake late Monday morning to be examined by Louisiana Department of Wildlife and Fisheries officials. The smell of fuel was still pungent after pulling the boat to shore. Executive Director of Cypress Park Robert Berry was present when the boat was dropped off at the marina. The boat was pulling an individual on an inner tube at the time of the event. Of the nine people that were on board, five were taken to the hospital. The driver, Stephen Ard of Shreveport, was hospitalized with a crushed vertebrae as well as back and head injuries. Two other victims suffered severe burns to the face and one also had a fractured vertebrae. A third female suffered an injury to her lower leg, and the fifth individual suffered injuries to her vision and troubles breathing. The boaters were visiting Cypress Park and had purchased a sticker for lake access on Saturday morning. The park registration showed that the boat was pontoon-style made by Hurricane. All of the passengers were wearing life jackets at the time of the explosion. 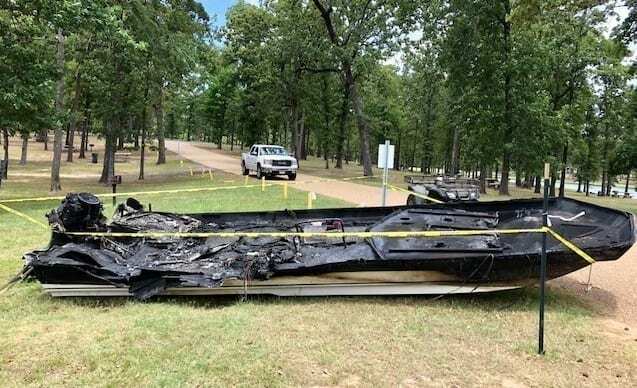 An investigator from the Benton Fire Department was appointed to be in charge of the investigation determining the cause for the explosion and examined the boat Monday afternoon with Berry. “We feel like it was definitely an explosion at the tank,” Berry said. “We pulled the top off and got to the actual tank that was underneath there. It was some kind of leak that caused it. He (Ard) was able to get ahold of the owners of the boat. The driver was not the owner, his parents own the boat, they’re an elderly couple. They do have insurance through State Farm, and State Farm has their own fire investigator. Berry said State Farm’s investigator and former Shreveport Fire Chief, Bo Roberts, will be in touch to set up a time to run his own investigation.